Likely your initial flight will be bound for Mumbai or Delhi, but if your final destination is a more remote location like Goa or Rajasthan, be sure to allow yourself a two-night stopover. It might delay your sightseeing some, but it’s important to allow yourself time to adapt to the Indian culture, overcome the jet lag and catch up on the sleep you likely missed on the plane. Though the nation offers most of the amenities your children might need, you’ll still need to take special care of anything unusual your children might require on the trip. For our vacations there, we make sure to pack UV-protective clothing, sunscreen, and homeopathic or prescription medicines. Mumbai is an expensive destination, even by European standards. If you’d like your trip to remain rat- and cockroach-free, you’ll have to commit to spending 100€ per night, if not more. We once made the mistake of booking cheaper. We arrived to the guesthouse in the middle of the night, exhausted and aching to finally sleep, only to discover they’d forgotten our booking. So began our miserable excursion through more than seven hotels to find new lodging with decent standards and availability. Hotels in Mumbai, as we found out firsthand, are booked well in advance, so make arrangements as soon as possible. We’ve had good experiences with both the Courtyard Hotel near the airport and the Taj Mahal Palace Hotel. Outside of Mumbai and other major population centers, your booking experience will be much cheaper and more relaxed. In Goa, for example, we managed to secure a room with AC for 20-30€ without having to book in advance. Rickshaws are everywhere in India, and more importantly, they’re cost-effective. Generally they charge using taximeters and they’ll get you from point A to point B faster than most cabs. 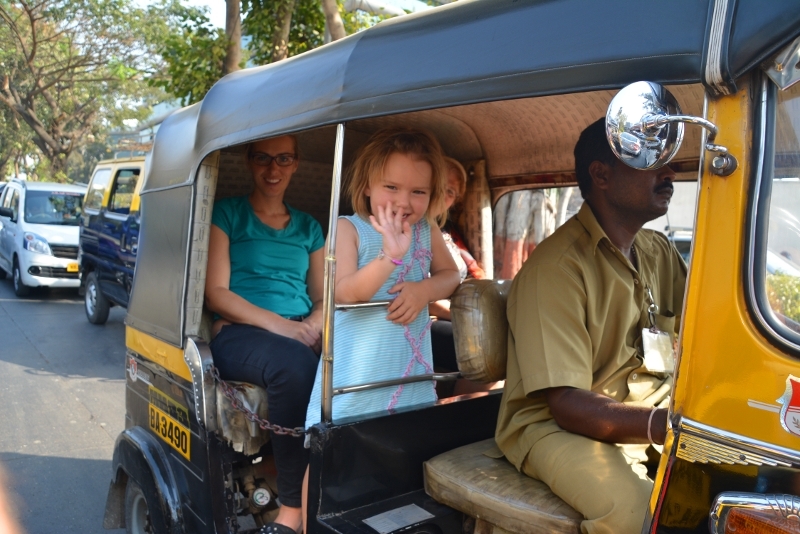 Children love the fun, fast and unique experience of a rickshaw. In Goa, we managed to convince one rickshaw driver to let us drive. It was, needless to say, awesome. Most of the locals travel by train, but before you do the same, it’s important to be aware of the cultural restrictions, including the separation of men and women. My husband unfortunately wasn’t aware of the regulations, and was nearly laughed out of existence by a judgmental group of local women. Special wagons for females exist for safety reasons, since men will often harass or molest women in crowded public places though we thankfully had no such experiences. Despite the dangers, travelling by train is a lot of fun and very cheap. Again, be sure to book in advance, as first class and overnight trains are often sold out. Domestic flights are operated by GoAir, SpiceJet, IndiGo and several other discount airlines. 4. Have fun while negotiating! Learn how to haggle! Taxi fare, clothing and souvenirs are all fair play for price negotiation. Fruit and vegetable markets are the only noteworthy exception to the rule. Otherwise, always start the discussion by offering half the price the seller quotes, so you’ll often end up paying maybe 70% of the original asking price. If your children are old enough and responsible enough to haggle themselves, give them the chance to hone the skill—it’s one they’ll likely use countless times throughout their lives. First off, beware the tap water in India. It is 100% undrinkable. Unfortunately, many restaurants still use tap water to cook food and wash produce. Steer clear, or you may end up like our daughter, who had to be treated for two days at a local hospital after eating strawberries from a street stall. Don’t take the risk—research what you eat. The restaurants that pay the most mind to cleanliness are the ones that cater explicitly to tourists. Watch for restaurants populated by locals and tourists alike, and you likely won’t go wrong. Again, avoiding the tap water is key. Most hotels offer water bottles beside the sink and advise guests to use bottled water for brushing their teeth. Make your children aware of the danger, so they’ll shower with their mouths closed and swim without sipping from the pool water. In India, hand sanitizer and other disinfectants will be your best friend. Be weary of every surface—even clean hotel toilets warrant a quick once-over with some antibacterial. Kids aren’t always ideal tourists. Ours ate only pancakes with nutella throughout the whole trip, for breakfast, lunch and dinner. After three days of the same, we encouraged them to branch out, but the local flavors were far too spicy for them. Eventually we decided not to pressure them. They were eating, and that was enough, especially when some parents struggle to make their children eat anything when they dislike the local dishes. 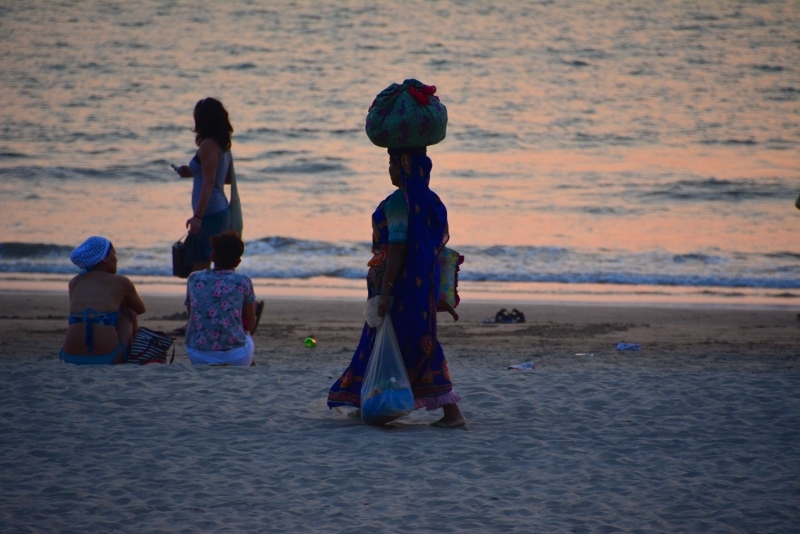 India is a developing country, and it’s unrealistic to expect it to be just like home. Put on a happy face and deal with whatever situation presents itself. Your children, and your India vacation, depend upon you. Would you like to travel to India with children? The environment in the West is often far more sterile and clean – that’s the major problem with travel to India, there are so many bacteriae and pathogens that a person coming from a developed country will often have problem dealing with. The stories I’ve heard from other travel bloggers always cite sickness. That might be true. Though I think it’s good to cope with “foreign” bacteria early so your body knows them and you won’t get sick there afterwards anymore. Great post, I will be showing this to my friend who I was just speaking to about how she wanted to travel but felt she couldn’t because of her child! I was on the look out for something to prove to her otherwise! Thanks! Roaming Renegades recently posted…Exploring the ruins of Castle DEVIN on the Slovak/ Austria border. 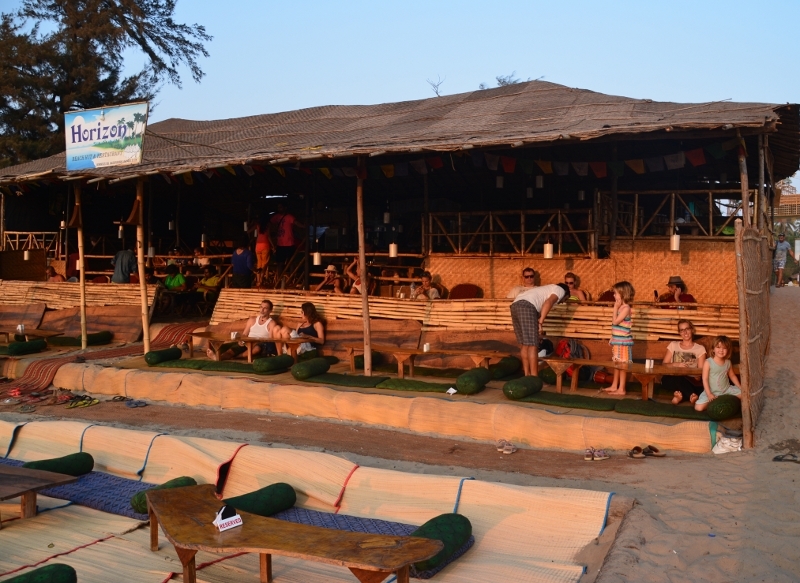 I do recommend Goa for “India beginners”. It’s beautiful and safe but nevertheless fun. If your friend has some more questions I’ll be happy to help! The prices in Mumbai made my eyes pop. That is freaky expensive!! I was shocked by the prices in Mumbai as well. However it’s nice to stay for 2 or 3 days in Mumbai but leave soon for some other places. There’s not that much to see there and the pollution makes a stay less comfortable. 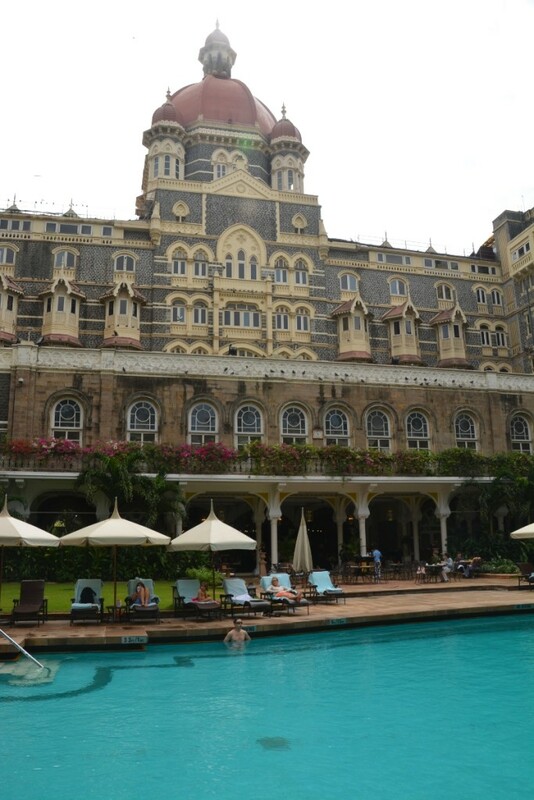 So thanks to your photo, I simply must stay at the Taj Mahal Palace Hotel some time. Do you use Pinterest? I would love to have pinned some of these beautiful photos. You are a brave woman. I haven’t even tackled India yet with just myself, let alone small children. These could apply for anyone! I might not have kids, but will definitely take some of these suggestions to heart, especially: stay clean and alternative modes of transportation! I don’t have any kids but it sure looks like there’s some great tips here! I’m always weary of tap water when I go abroad as it is super easy to get sick from even the smallest amount on washed fruit or veg. Hopefully your daughter was okay! Emma Hart recently posted…8 Reasons Why I Miss Sydney So Freakin’ Much. It took some days and then she was fine. Thanks! But we started being very careful afterwards. Some great tips! I don’t have any kids, but I a lot of young couples who think they can’t travel because they have kids. I can imagine that there’s much more planning involved and that the trip will be different, but it’s definitely possible. Thanks for showing that! But bravo to you for taking your family there. I am always trying to convince people that they CAN take kids to India. It’s an amazing country and even more amazing through the eyes of tiny travelers! Hi, I am thinking of taking my 2 year old son to India this December, I’m being discouraged to do so because of pollution and hygiene… After reading several posts, I’m not keen of leaving my son for 2 weeks and I want him to be part of the adventure or should I wait for him to be a bit older? It’s so wonderful to read about all these tips out there! A big THANK YOU for sharing the blog with us! I’m excited to travel with my family around the world but I’ve never been to India, after reading your post, I decide to go there on our next vocation.